My home is a ranch-style house, which stretches across two lots. Previous owners kept adding onto the sides, so it’s wide. The wifi hub in my office (almost near the center of the house) couldn’t reach the back bedrooms. I added a second Apple AirPort to try to extend the wifi network to the back bedrooms, but too many walls got into the way. Eventually, I strung an ethernet cable through my attic and down into the master bedroom. There I connected a third wifi router to cover the whole house, but it wasn’t an elegant solution; I ended up with two wifi networks. As a solution, I chose the Google WiFi system. The three hubs create a mesh network, which is the solution I wanted. Thus began the ordeal of switching from one wifi network to another: The hardware setup took no time. Getting all the computers on the Internet and happy took the better part of a day. For the initial setup, I connected the primary access point puck, shown in Figure 1, to the broadband modem. I also plugged the puck into my switch, which gathers all the wired connections in the office and rest of the house. 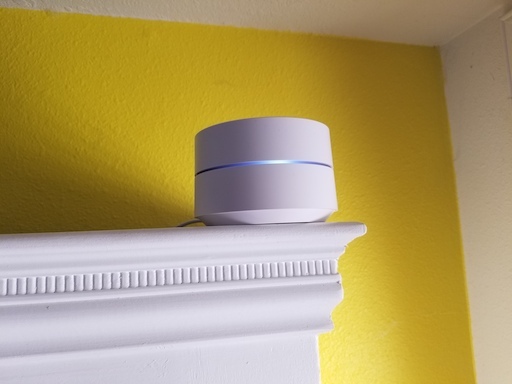 The Google WiFi app on an Android gizmo configures the network, which is painless. I chose to use the same network name (SSID) and password as the old network, thinking I was being clever. Figure 1. The primary Google Wifi access point, or “puck,” in my office. The second puck was easily setup, as was the third. I was tickled with how easy the operation went. My phone and tablet had Internet access over the new wifi network and I didn’t need to change their passwords. My wired computers, however, couldn’t see the Internet. After confirming with tech support that my hardware configuration was accurate, I restarted the network: Shut down the modem, all wifi pucks, and every switch. Then I turned on the modem, wifi pucks, and all the switches. That trick worked, and almost everything was happy. Almost. The two puzzles that remained were my network fileserver and the Wambooli Porchcam. Both devices were configured on the old network to use static IP addresses. I had to figure out how to use the Google WiFi app to assign both pieces of hardware a static IP. That wasn’t as difficult as I thought it would be, but yet both devices stubbornly refused to join the network. Long story short: Each device was configured to access their old IP and the new network used a different IP address scheme. I downloaded software to locate the wayward gizmos, find their current IPs, configure the connection, and get access. So after many hours of configuration and confusion, things are finally back to norbal. My Company had an issue yesterday…All the WiFi had switched channel over night so people who used the WiFi were looking with shock as there device didn’t connect. The re-boot caused the ID’s to switch back to default, which caused issues with interfereance, the IT dept spent the first hour of the day running around like mad!